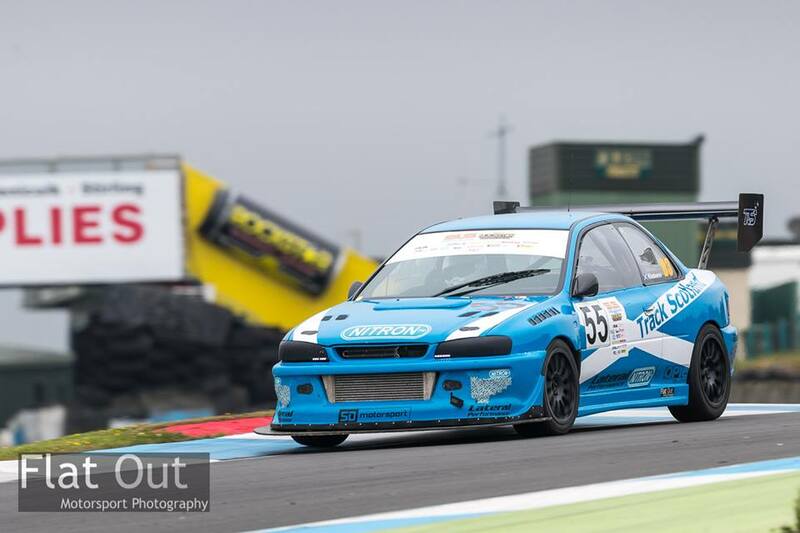 #SuperLapScotland Rounds 2 & 3 at Knockhill Racing Circuit. Warmup - Slow out lap finding what the standing water was like, keeping speeds on the straights fairly low and tried a bit of power exiting. No major issues getting power down. 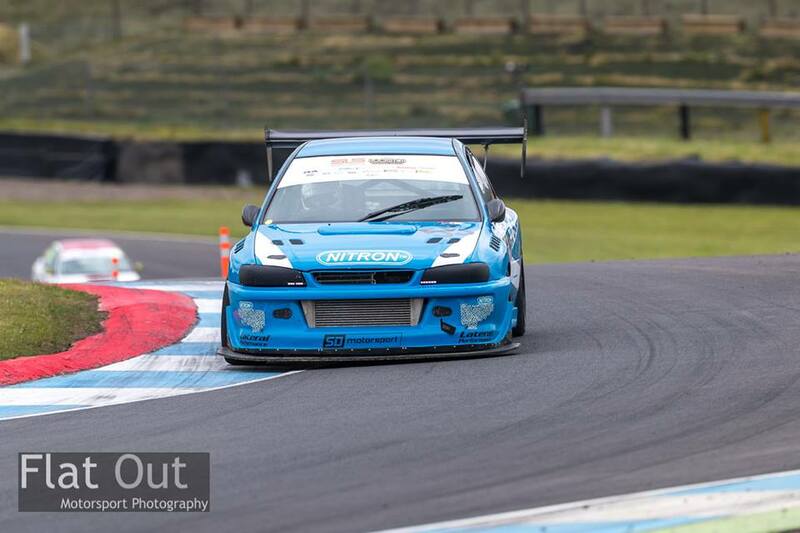 Went for a lap and the car just felt awful at speed, and terrifying trying to brake at ~120mph down the back straight. It felt like a really strong cross wind... so gave it another go as the car felt fine along the back into Clarks. Managed a 64s lap, and promptly binned it in a fairly big way trying to slow down into the hairpin. Car slid sideways down the track from about 125mph, dipped wheels into the grass which put it side on for the gravel on inside of hairpin. Luckily (?!) 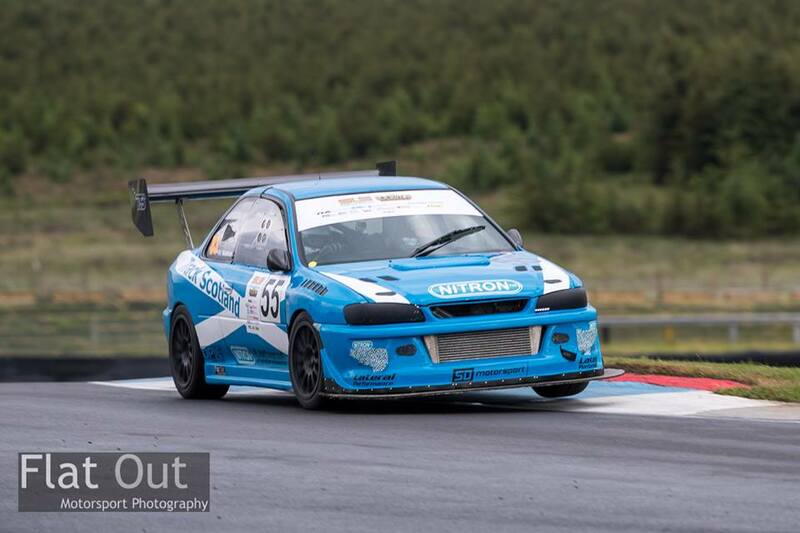 the car seemed to bounce out of the gravel rather than dig in, and I landed on the track sideways and slid off into the next gravel trap at speed. I thought it was going to be a big one, but thankfully the gravel traps pulled the car up :O New pants required. Fee was out after this... so car was given a quick once over and she was told not to push it! She comes in and says the car is absolutely fine. WTF!?! Have I forgotten how to drive straight? 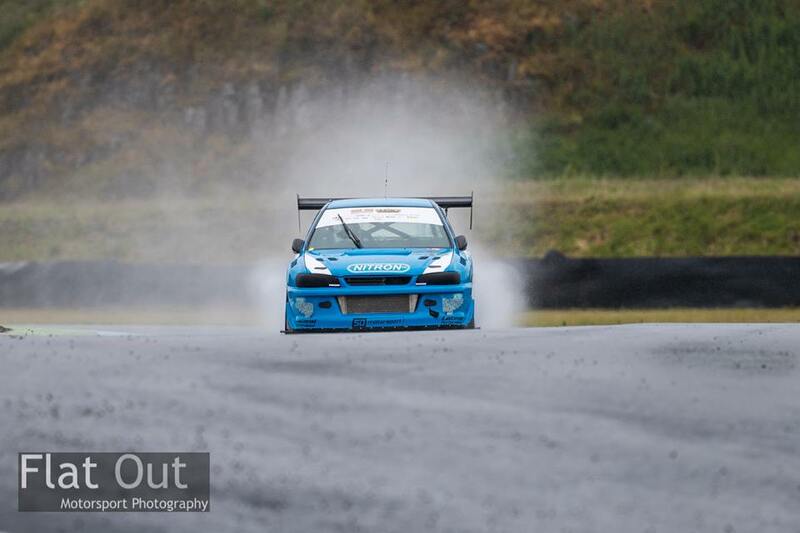 Qualifying - Rain had eased, so gave it some more beans and the car felt fine... tyres werent ideal as I'd been playing around with pressures and was on a setup I would normally hate... and still hated it. Still, did enough to get P1 in qualy. The rain came on heavy again and just came back in... via the gravel at slow speed!! Fee had a bit of rain early in her session and finally got what I was telling her about... the car was EVERYWHERE once at speed. Rain eased and she managed to set a decent time. Final - Qualified P1 so get to run last and know how hard I need to push (in theory). Car sharing so Fee went out first then handed over. Outlap was very patchy with areas of wet/damp and dry... 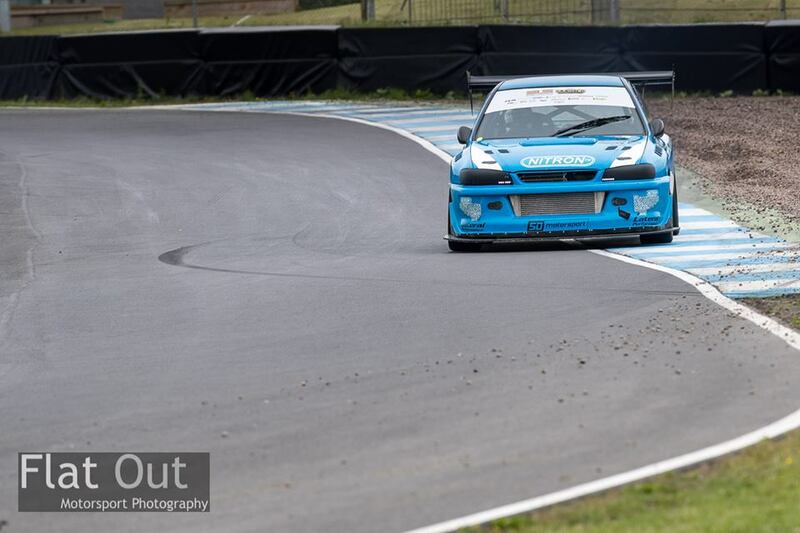 Came over duffus to start the lap and realised I was taking it too easy, braked for the hairpin... got back on the power as the brakes now slowed the car rather than steered it... DOH. I thought it was a no hoper by this point but got some momentum up on the second part of the lap and managed a low 58 in the damp. Surprisingly good enough for P1. Happy end to a horrible and testing day! Full 40 points for the day. Warmup - old tyres, base boost.... boom 55.1 on the first lap. Happy enough considering I wasnt pushing . Into pits to give it all a rest and handover to Fee in a relaxed fashion. Didnt finish top in class, but meh... only warmup Keith beat me by 0.022 after doing 13laps. Practice - a bit more boost and a bit more driving. 53.9 on lap 1. Park it. Job done... still more in the tank. 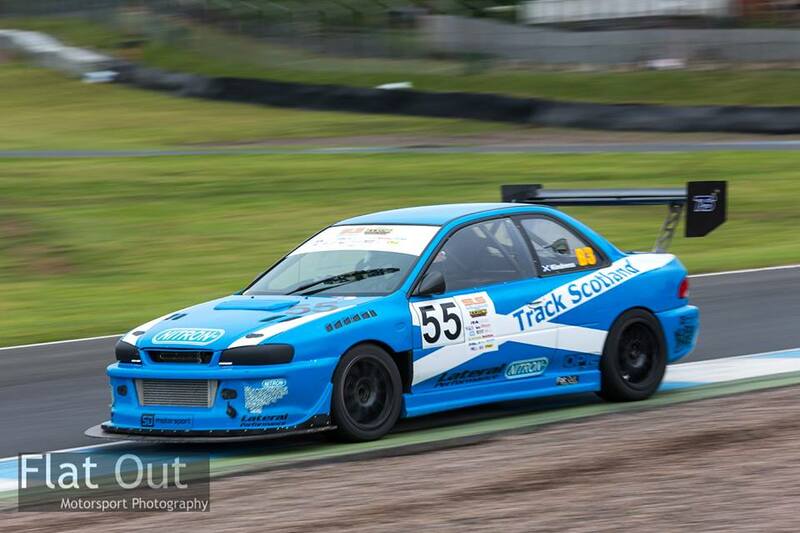 Will Robson wasnt far behind though, and was taking massive chunks out of his previous laptimes! One to watch. Next up was the Rockstar Energy Drink UK 'Chase Series' qualifying. Same plan, same power but with better tyres = another 53.9 (slightly better, so another PB ) and a result of 2nd on the grid, behind David Long. Good stuff. SLS Qualifying - On the 1 year old tyres and second highest boost setting. Same plan, 1 lap and in. Threw it down duffus all fine, but McIntyres was horrible, then Clarks was back to the same horrible mess that I was making of it last year (last SLS round of the year)... Hmm. Could only muster a 54.2 despite pushing harder.... I knew I'd lost a lot of time at clarks lifting out of the throttle for a long time, but still some headscrathing. Result - qualified P1 by about 0.5s, with Fee in 2nd doing a 54.8 and Will in 3rd. We've run this setup for ages, but the car has really changed at Clarks (old and new surface) since 2 very subtle changes to car spec. A bit more bullshitting with Andy Lamont led to him resetting the front end (on the ground... on the fly... by eye) Geo to a setup that prob wasnt either of our first thoughts! Still, I was pretty confident I could drive round it if it was just as before. SLS Final - 1 lap to decide the day.... suites me fine I also like the tyres to be cold so I know how to get them up to temp rather than having to reduce/manage them (i'm crap at that!)... so some decisions to make me run 1st (to remove a perceived advantage) and Fee last helped both of us out (she likes the car warm). Out lap in usual style but attacked Clarks at pace, and got round it with little drama. GAME ON! I had a bit of motivation and a car than was behaving, full boost, beast mode... outcome was a full second off my PB and a new Lap Record (I think I'd actually broken the lap record earlier in the day but would need to check - It was 53.9xx by David Brown in the Automek Lotus). 53.0, P1 and second overall to Andy Forrest. Fairly happy with that, and happy to see Fee on the podium too, back down into 54s Goalposts have moved again though wifey! 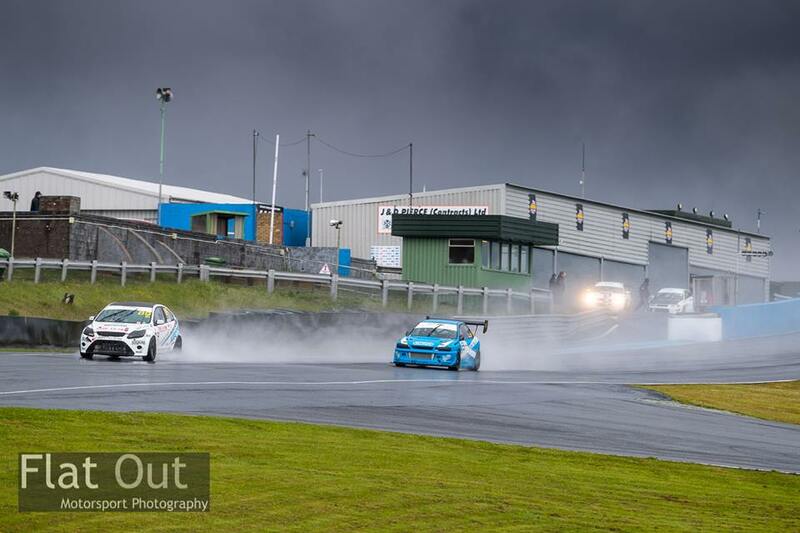 Good weekend despite the very trying conditions on Saturday. 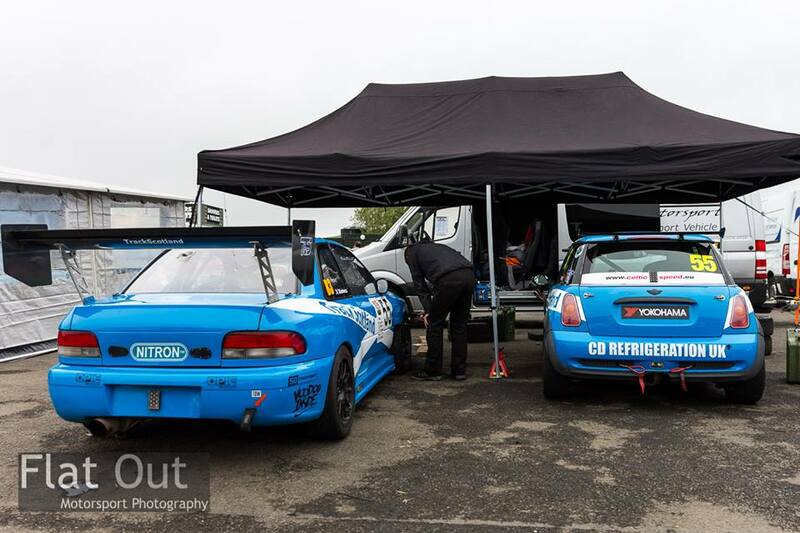 Thanks to Matthew/Simon at MB Garage Services & Motorsport for persevering with the dry sump leak saga, to Andrew Lamont for rolling around on the floor under the car in the soaking wet because I was in too much of a huff to comprehend that I couldnt simply drive around it LOL. Fiona for going fast again , Karen O'Brien for providing childcare services in return for race car usage! Car Spec - EJ22 with Lateral Performance 2.35 stroker kit, MDX321V turbo, AVCS heads. #Syvecs ECU. OE 6sp DCCD gearbox, KAAZ 1.5w rear LSD. SD Motorsport Limited gearbox cradle, AS Performance bits n bobs, Zen Performancedry sump and some custom 'bodges' thrown in. Power - 350whp, can have ~80whp more and stay in B.